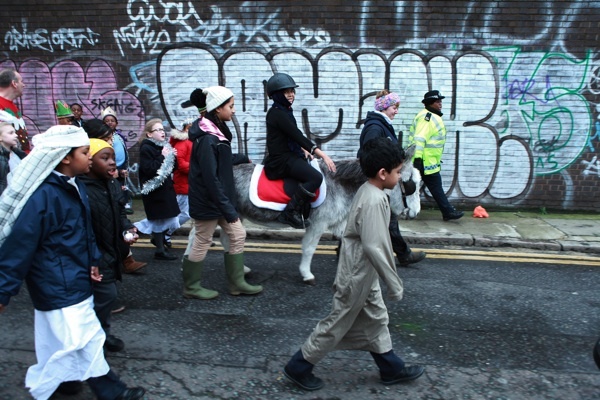 There was no doubt whatsoever that the Christmas season had arrived in Spitalfields last week when a procession of characters from the nativity story advanced up Brick Lane accompanied by all the pupils of Christ Church School singing carols. Contributing Photographer Colin O’Brien & I arrived at the school just as the final preparations were taking place. In the hallway, school governors, members of the parent-teachers’ association and any other adults that could be recruited were changing into colourful biblical costumes. 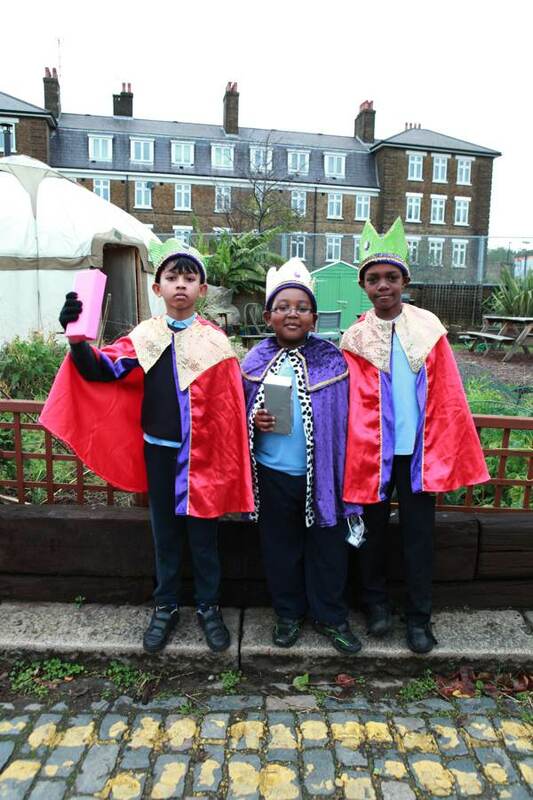 They were joined by the pupils, some of whom had been assigned specific roles in the drama and other who had opted for generic nativity outfits. 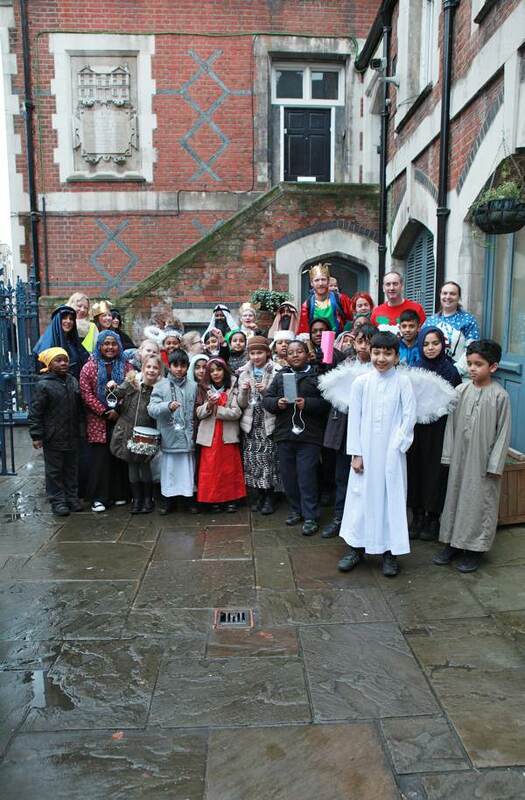 Once we were all gathered in the yard at the front of the school, there was just time for a group photo before the unlikely procession set off up Brick Lane, singing carols enthusiastically to dispel the grim atmosphere of damp and cold. The curry touts were astonished by this unexpected demonstration of seasonal goodwill and resisted their natural impulse to offer meal deals and free beers to Mary & Joseph, on the their way to Bethlehem via Brick Lane. 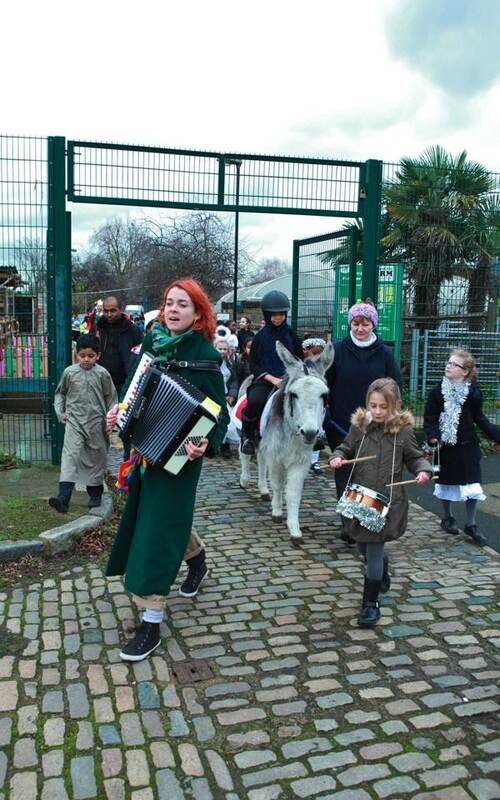 In fact, the first destination was the Spitalfields City Farm where the holy couple were to acquire a donkey for Mary to ride on their journey. 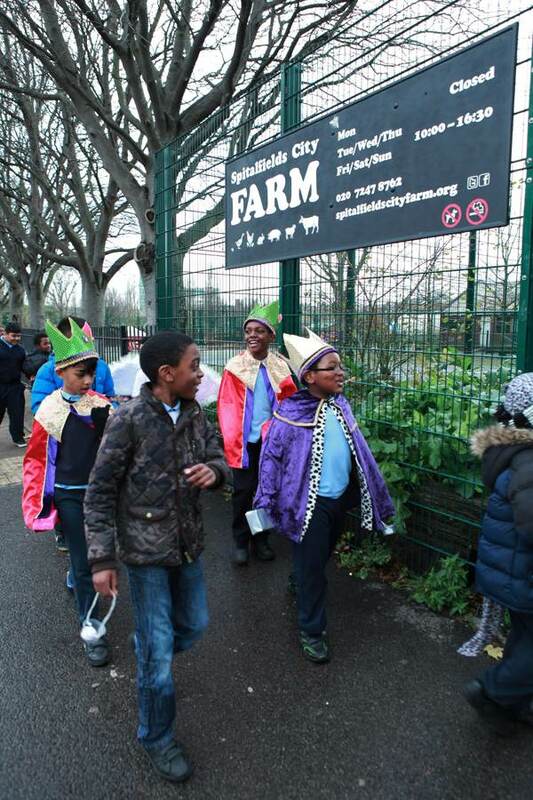 Although legend has it that farm animals gain the power of speech on Christmas Eve, the pig at the City Farm grew impatient and joined in loudly with the carol-singing last week, much to the delight of the school children. 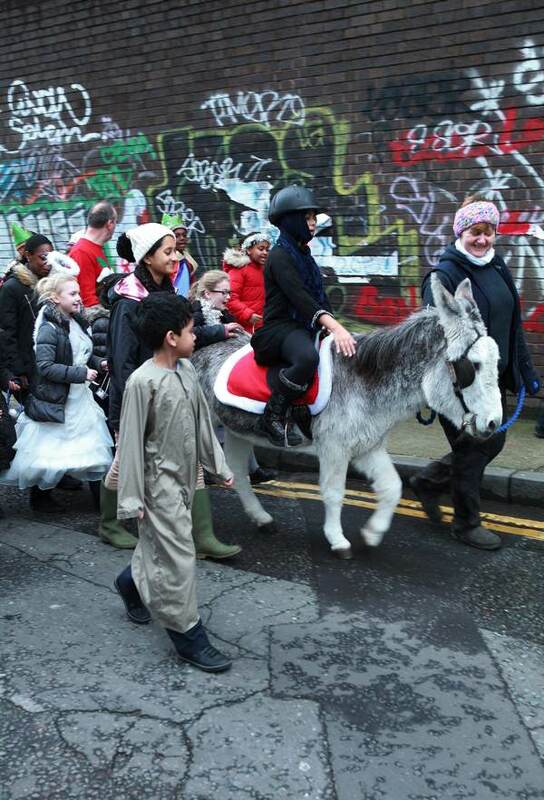 After readings telling the nativity story and more carols, and once Mary had put on her safety helmet and was securely mounted upon Bayleaf the donkey, we were all set to continue on our Christmas pilgrimage around Spitalfields. The attenuated procession stretched the length of Allen Gardens, offering great amusement to passengers on the East London Line gawping in delight from the train windows as they sped by. We crossed Brick Lane again and followed the perimeter wall of the Truman Brewery to emerge onto Commercial St. Passing along the side of Spitalfields Market down Lamb St, the procession entered Bishop’s Sq just as it was thronging with office workers at lunchtime. 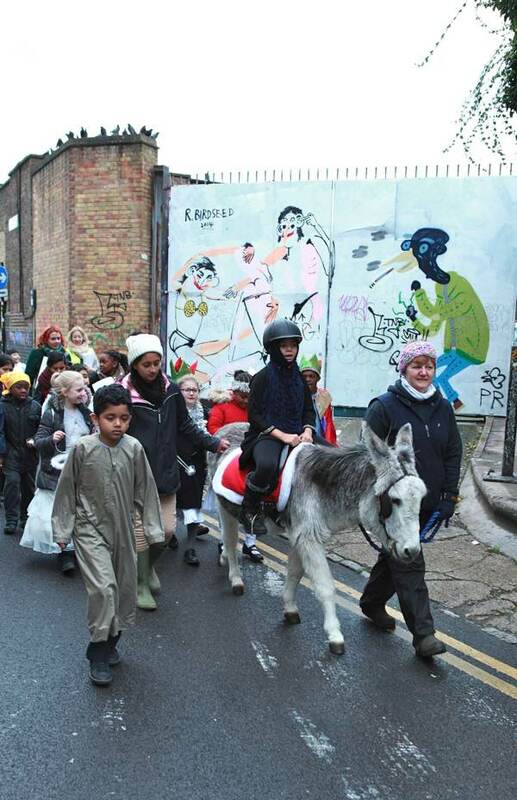 The line of singing children led by a donkey had come to invade the adult workaday world, as harbingers of the approaching festive season – they had come to remind everyone that in less than two weeks everything must stop for Christmas. 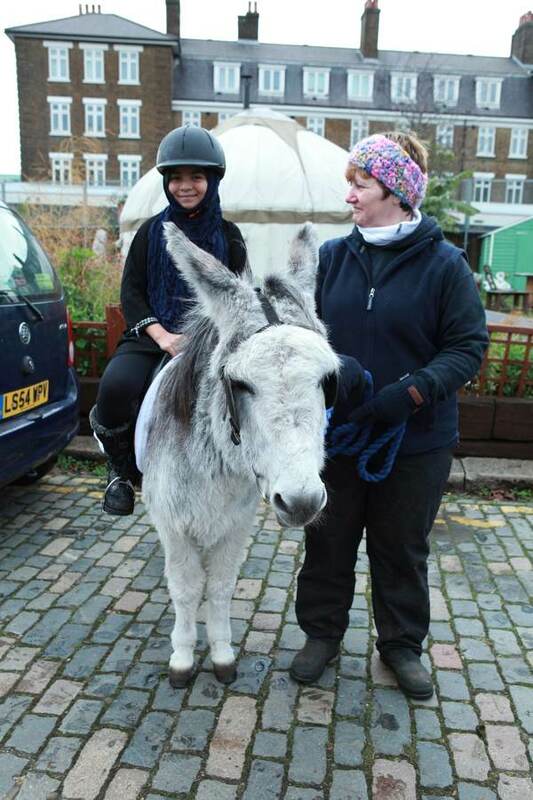 What a delightful story–Mary is adorable and so is the donkey (though I doubt the original Mary had to wear a helmet!). Such a lovely reminder of the Christmas spirit amidst the shopping frenzy. I so love this. I mean I really, really, REALLY love this. I am a middle aged British man, from a mixed race British-Asian family, with an Asian-British child, and for that reason, I have the deepest interest in seeing my own children and my own family work out the future of Great Britain, and yet, I have a dualistic, troubled feeling about these pictures — on one level it is fantastic, to see all nations, celebrating together. But on another level — is it all to be celebrated? Firstly, from an Islamic perspective, what these children are doing is ‘shirk’ and ‘haram’ and these practices are profoundly alien. And yet, on another level, these practices are theologically serious, personal, ancient and heartfelt ceremonies to Christians of all deeply rooted communities, from Syria to Jenin to Gaza, to Munich to sleepy Suffolk and on to cosmopolitan Moscow: does it really help multiculturalism as a deeply rooted reality to step forward genuinely, when other faiths are simply playing cosmetic roles in this profound Passion Play , when they do not even follow the same theology? Isn’t it a bit like Christians and Muslims and Buddhists role playing in serious Jewish ceremonies and festivals? Should Christian and Muslim children be encouraged to play leading, dominant roles in the deeply felt festivals of Purim, Rosh Hashanah, Yom Kippur, and Hanukah? Should we be encouraging Christian and Jewish British children to play leading roles in Shia and Sunni ceremonies? Is that really the way forward for all of us inter-racial communities? Since I am from an Asian British family, and it’s in the interests of myself and my neighbours to work out excellent and deep rooted relations of integration, good neighbourliness and good will, I ask myself these questions non stop. Or are these pictures telling us that Christians do not even take their own religious ceremonies seriously anymore? Can any British Christians, Muslims and Jews help me out on these questions? PS My message is very genuine and in the spirit of true cultural and ethnic respect, and it is not intended to provoke. I’d like to see what others think about these issues. 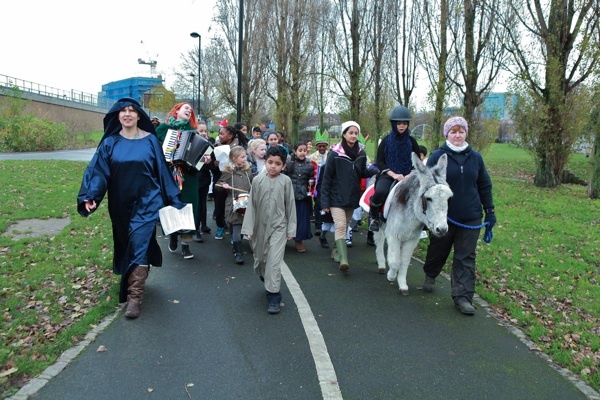 Lovely Nativity Procession! This is why I live in this city. What a joy to see a multi faith (presumably) nativity that hasn’t been banned because it upsets someone, thank you so much for sharing and well done to all involved, your hard work is much appreciated! I love your blog, there are always so many interesting things to read about every morning over my coffee, but this was special. Thank you, and thank you to Spitalfields for sharing the true meaning of Christmas. 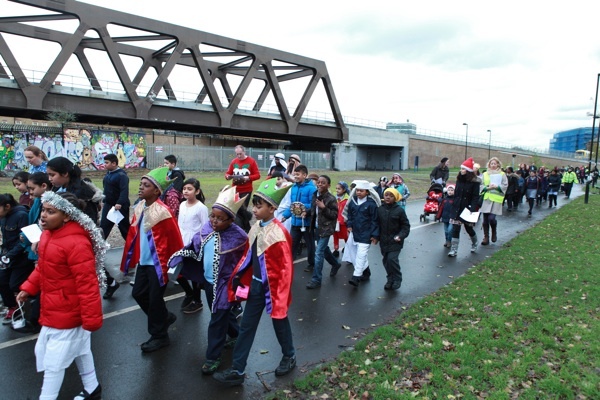 The Children take these Procession very seriously and with much fun. Very expressive is the Angel! — A very happy Christmas time to all! Really appreciated GJM’s thoughtful response to this. Yes they are really beautiful pictures which certainly brightened my day but I do hope that parents of the children involved feel comfortable with what their children were taking part in. I know that it is a Church of England school and so I am sure that there has been much consultation about the way in which Christian values and stories are shared in the school. 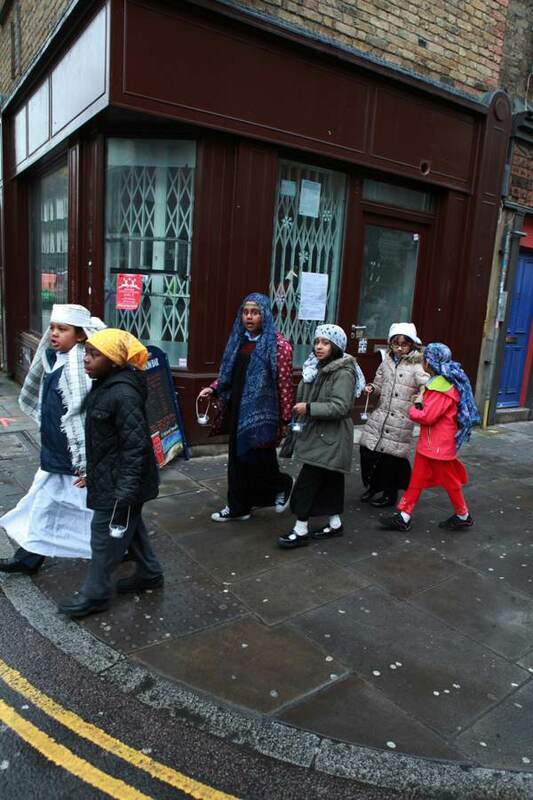 I am a white, Catholic raised, mother of three children who have been educated at non-faith state schools in Newham (a neighbouring borough with a large Asian population which, incidentally helps greatly to improve exam results especially in the sciences). Over the years our children and their friends have appeared in various celebrations and representations of feast days such as Christmas, Diwali, Eid, Guru Nanak’s birthday, Harvest and some confusing mash ups of these. I don’t know what the children have made of this though there is, I suspect, a degree of tolerance – and knowledge – which is missing among the older generation. I know that as a parent my great sadness is that whenever I take my children into the National Gallery their comprehension of events portrayed in great art (the nativity, the passion, the arrival of John the Baptist etc.) is seriously limited. And I do know that it is my job to rectify this! Thank you again GJM. As our children grow up and their lives become ever more intertwined these questions of how we get along and yet retain our cultural identities become ever more important. Absolutely wonderful! I will be showing this to our children at another Tower Hamlets School this week. Thank you! Thank you for posting these pictures – a joy! They celebrate the birth of a child and in turn, it is a time of year that many of us try to bring joy to children and give thanks to the joys that they bring us. Saddened to read of GJM’s anguish and doubts about this. We spent 5 years in India in the ’80′s and believe me, the populations up and down the country very much joined in and shared each others faith festivals and celebrations. Many from that time wouldn’t recognise their kinfolks in modern-day Britain – living in segregated bubbles in virtually sealed off communities – through choice! Easter is the deepest and most seriously observed event in the Christian calendar. Christmas however, it must be remembered, is not an *exact* birth date of the infant Jesus. The date was chosen in the west to represent a mid-point of the chill and dark of mid-winter, having been previously the time of a pagan festival. In celebrating Christmas, we celebrate our/all children. The wider message, I feel, is to include rather than exclude. These pictures remind me of many happy, shared times in India when neighbours and neighbourhoods invited others (and us) to join in Diwali, Holi, Eid, Christmas, Vesak, etc etc. Lovely pictures, only children are capable of the true warmth of human togetherness. Nice to see an event like this can still take place without muck raking by various groups of opposing ethnicities. I think multi culturism has eroded the old ways of thinking and that can only be a good thing. I do think though that ‘a level playing field’ is still not acceptable to some and their views will rumble on and agitate for decades to come. Good to see the CofE can still worship and rejoice in what I believe should still be considered a christian country. That is all soooo beautiful! A new generation of Spittlefields Nippers struts their stuff! 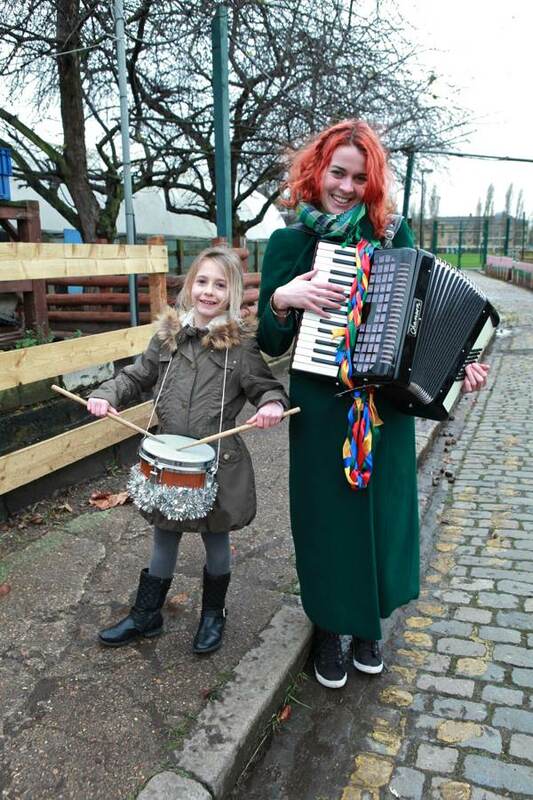 Loved reading this and seeing pupils, teachers and parents take part in the procession and a donkey from the city farm. So refreshing to see different parts of the community come together to demonstrate the nativity. Such a different and refreshing approach to the bland ‘winterval’ celebrations which skirt around the elements. 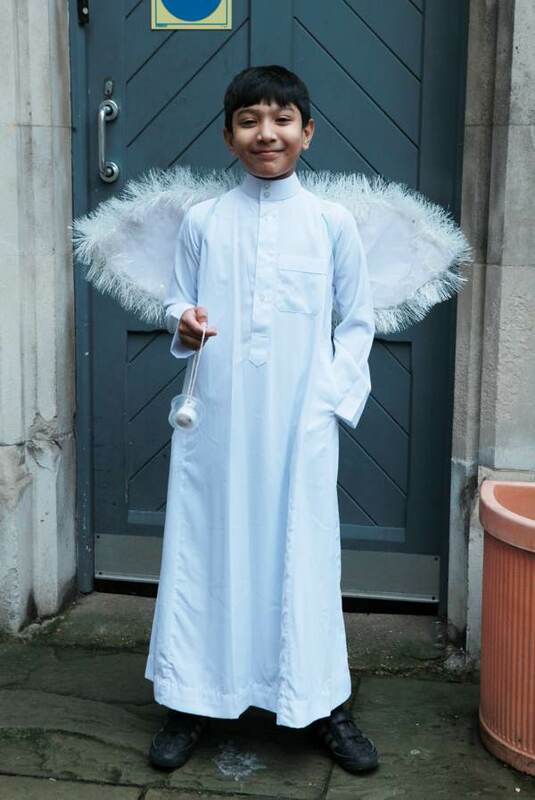 It would be lovely to see this approach used in some of the other festivals from other religions as the children looked so obviously to enjoy it. Thanks so much for sharing. I taught at Christchurch C of E Primary for ten very happy years in the 80′s. The school community was 98% Bengali then and very popular with parents, as to have a school ‘without God’ was an anathema to them. Wonderful pictures and lovely memories- thank you. Merry Christmas children! Many people around the world today, held prayer vigils for the children slaughtered in Pakistan by their co-religionists. I received several emails and links from Indian Hindu friends also doing so. This article and the photographs of the children here joining together, is all the more poignant and moving.